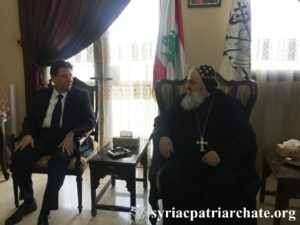 His Holiness Patriarch Mor Ignatius Aphrem II received, at the Patriarchal Residence in Atchaneh – Lebanon, His Excellency MP Ibrahim Kanaan, Secretary General of the Reform and Change Parliamentary Bloc, and Chair of the Finance and Budget Parliamentary commission at the Lebanese Parliament, as well as MR. Georges Jabbour, Mayor of Atchaneh, Mr. Paul Maarrawi, CEO of PMP for Contracting, and Mr. Charbel Khalil, CEO of Zerock Group. His Holiness discussed with his guests issues related to Lebanon. Very Rev. Raban Joseph Bali, Patriarchal Secretary and Media Office Director, and Very Rev. Raban Jack Yakoub, Director of Suryoyo Patriarchal Youth Department, also attended the meeting.